Mike Throne lives in Northern Virginia with his wife and three daughters. A graduate of Goshen College, Mike spent twenty-five years running a windchime company until, in 2006, he sold the business to begin working on his new passion—fiction writing. 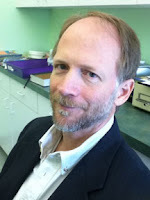 He has been learning his new craft through courses at Northern Virginia Community College, George Mason, and Faithwriters.com, a Christian-based online writers’ resource. Other stories written by Mike can be seen at http://www.faithwriters.com/member-profile.php?id=50794. When he’s not writing, Mike enjoys camping with his family. WOW: Congratulations on placing in the top ten in our Winter 2013 Flash Fiction competition! What inspired you to enter the contest? Mike: I love micro-fiction and the WOW contest is the best micro-fiction contest I know of. There are a limited number of entries, the fee is reasonable, feedback is available, and the quality of the writing is excellent. Obviously, I appreciate the fact that the "Women on Writing" contest is also open to men. It is the encouragement that I receive from contests like this one that keeps me going when there isn't much other positive feedback coming. WOW: Thanks for the kind words about the contest. Can you tell us what encouraged the idea behind your story, Boarder in an Old Green House? Mike: Sadly, it's where I see us going as a country in the not too distant future. With our casually excessive spending and unwillingness to tax enough to cover it, I foresee serious problems for everyone, but especially for the elderly. We simply cannot afford to keep all the promises we've made and unless we admit that and resolve to fix it soon, I see a significant drop in our standard of living as the inevitable result, again, especially among the elderly. Boarding houses used to be popular in the last century and I suspect that they will be again, as a low cost option for those who can't afford a home or an apartment. That said, life in a boarding house is still life, and there can be positives in any living arrangement. Boarder in an Old Green House is the portrayal of a couple who grow closer, despite this backdrop of a wrecked economy and their best days being behind them. WOW: You did a great job with the story. What was your editing process like? Do you have any specific editing techniques to share? The most difficult part of my editing process is that I often can't tell if I have anything worth keeping for days, even weeks. After I write and edit a story, I love it and think everyone else should as well, because it's clearly one of the best stories ever written. It's only after the euphoria settles that I can read it though more realistic eyes and I can begin see the serious issues. At that point, I either dump it or go back through and edit it another two or three hours, then sit back again and see what I have. WOW: In your bio you mention running a windchime company for twenty-five years, which you sold in order to pursue fiction writing. How did you orchestrate that change, and how would you compare your life then and now? Mike: I started by selling windchimes at craft shows and flea markets, then, about five or six years in, began wholesaling and, eventually, grew the company into an actual factory. After many years of too many employees, I wanted out. I'd been approached by a number of brokers and even went as far as to have a contract in my hand, but the contract was written by the buyer, for the buyer, and I didn't feel optimistic about being able to resolve the issues. In the end, I decided to sell it to a good friend of mine who was the regional manager of a larger business than my own. So one day at lunch, I brought out my laptop, showed him the spreadsheets I'd prepared, and suggested that it would be a wise decision to sign on. It helped that his wife was my HR person. Because of the situation, I was able to achieve a number of things that were important to me and allow him to buy it without putting any of his own money down, which was fortunate since he didn't have any. The writing side is going a bit more slowly. I find it difficult to remain focused and come up with story ideas, and am often frustrated by my lack of production. But I trudge on and am happy to see gradual progress in my ability despite the occasional setbacks. WOW: It's exciting that you're following your dream and we wish you the best. You also mentioning camping with your family as a favorite activity. I have to admit, I’m not a camper. What are your favorite and least favorite things about camping? Mike: My favorite thing about camping is, at the end of the day, after my daughters have gone to sleep, sitting with my wife next to the fire and sipping a beer. I love spending time with my three daughters and find that camping gives us the chance to be together in unusual settings. We've made two cross country camping trips since I sold the business and are just about to start on our third and likely final trip. On this trip, we'll go from Virginia to Colorado to see some friends and camp in the Rockies, then go up to South Dakota to camp at our favorite place in the country, Custer State Park. Herds of buffalo roam freely throughout the park, along with other wildlife, and we love the cool, breezy air of the upper Midwest. My least favorite thing has to be pulling the trailer. We have a hybrid, so it's not too big, but the wind plays havoc with it sometimes. On the whole, camping's always an adventure and it's always worth it. WOW: OK, you do make camping sound better! Thanks so much for chatting with us today, Mike. Before you go, can you share your favorite writing tip or advice with our readers? Mike: Thanks for the interview. The only advice I have is the same advice I give to myself --keep at it. Don't stop, don't give up, and good things will eventually happen. Visit the contest page for details. Mike--Making wind chimes--things that make beautiful music when they are moved by the wind--began it, and now you are moving people with beautifully-crafted words. Good luck on your journey, Mike. Mike, you have led such an interesting life with interesting careers! Thanks for the kind words about the flash fiction contest, and I wish you much success in the future! Do You Use an Email Signature?